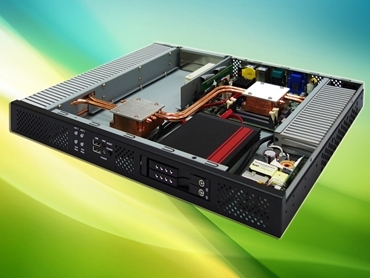 Backplane Systems Technology introduces Perfectron’s ROC235A, a new 1U rackmount fanless rugged server based on Intel’s QM77 chipset and supporting Intel’s high performance Core i3-3120ME (35W), Core i5-3610ME (35W) and Core i7-3610QE (45W) processors. Perfectron’s ROC235A is designed for use in digital signage, industrial automation and self-service applications. The industrial grade server features wide range DC inputs (9V~24V) and wide operating temperature range from -20°C to +70°C, and supports dual 204-pin DDR3 SO-DIMM system memory up to 8GB DDR3 1333/1600 SDRAM capacity. Incorporating six copper liquid-vapour vacuum tubes, the ROC235A’s unique thermal design efficiently manages the system’s heat dissipation with the rugged mechanical structure also providing better vibration resistance and maintaining perfect computing performance. Featuring a black finish and measuring 44mm high, the ROC235A has large, open honeycomb vents on the top, sides, front and back of the enclosure instead of a fan to allow for natural convection cooling. One or more honeycomb heat dissipating vents can be installed around the circuit board or power supply, to quickly expel heat via the honeycomb cells without occupying much space. The unique design increases the heat dissipating area, allowing for a faster cooling effect. Key features of the Perfectron's ROC235A rackmount servers include power, HDD and LAN LEDs located on the front panel; a versatile range of I/O connections for easy integration with a variety of applications, including three display interfaces (HDMI, DVI-D and VGA), audio Mic-in, Line-out, one COM port, two Ethernet LAN and four USB; and one PCI or one PCIe plus one mPCIe expansion slot onboard allowing users to add additional functionality such as Wi-Fi or GPRS.